Thom Yorke and Nigel Godrich celebrated the impending release of Atoms For Peace’sAmok with a special DJ set in London last night. However, the performance was more than just clicking play on iTunes. As At Ease reports, Yorke sang throughout the 12-song set, which included material from both Amok and his solo LP, The Eraser. At some points in the show, Yorke even played guitar. Below, you can watch 30 minutes worth of last night’s performance, starting with “S.A.D.” and ending with “Reverse Running”. 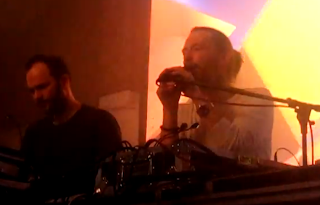 Yorke and Godrich will next perform together in Berlin and New York City before joining us with the rest of Atoms For Peace for full-band performances at three European festivals in July. Amok hits stores February 26th through XL Recordings.